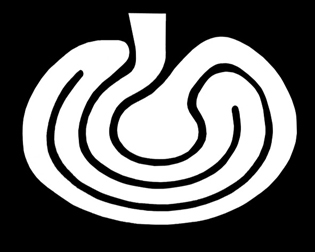 The Labyrinth Society: The Labyrinth Society: TLS Members e-Newsletter - Want to Be Part of Jim Buchanan's Latest Art Project? Want to Be Part of Jim Buchanan's Latest Art Project? Among the many highlights of every Labyrinth Society Gathering, one of the most fun is the surprise element characteristic of the keynote speakers. Perhaps because TLS guarantees, by definition, a "liminal space'' to play, and labyrinth folks are so grounded in the practice of exploration, we are treated to some of the most creative, insightful, edgy, and extraordinarily rich sessions imaginable. at the Alberta Children’s Hospital, Calgary, Canada. The brief - TLS members are invited to send Jim "a crack that lets the light in." Download the artwork graphic (via the link below), print it out, rip it according to the directions, then post it (yes, that’s snail mail) back to Jim for insertion into the overall artwork. The graphic is a bold black space, but the personal physical act of ripping creates a new opening, a rip, tear, or crack to let light through. You may be fast and spontaneous, or slow, meandering, and deliberate, each will have a personal character to contribute to the labyrinth of light projection. The mailing address is on the graphics page. Snail mail is utilised in this project as Jim’s processes of making a labyrinths are physical and about engaging the body senses. It also connects this project, with the very starting point of realising the first "labyrinths of light," whereby Jim tore up labyrinth image postcards to create projected designs. The reward - For each person who contributes to this artwork, Jim will provide a signed print-out of the resulting gobo artwork – during the Gathering for those attending, and by post for those not attending. 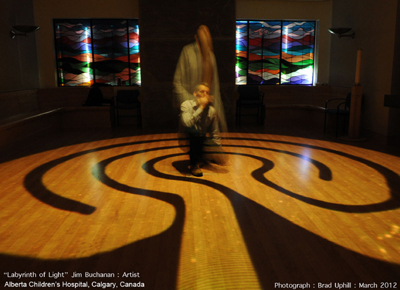 But most of all, those attending get to walk a labyrinth of light that they have contributed to making. circular ground plan when projected at an angle. The prize - The original paper artwork that I use for the labyrinth design (large paper format), will be annotated and identify where people's contributions sit within the design. I will offer it to be available for purchase as part of the silent auction. I hope this is another 'enticement' to both attend the gathering, and the interaction. Next step - Here's a link to the image for you to print off and rip down, and post back by the deadline of Saturday October 18th 2014. Look forward to receiving your artwork and walking with you at the Gathering.